Could there be a more quintessential cake for a summer celebration than an ice cream cake? I think not. Hot days meet cold cake in the most perfect of pairings. This whole ice cream cake situation started several years ago when my husband was lamenting over his love of Baskin & Robbins ice cream cakes from his childhood birthdays. We don’t have a B&R around here anymore and he hadn’t had one in many years. 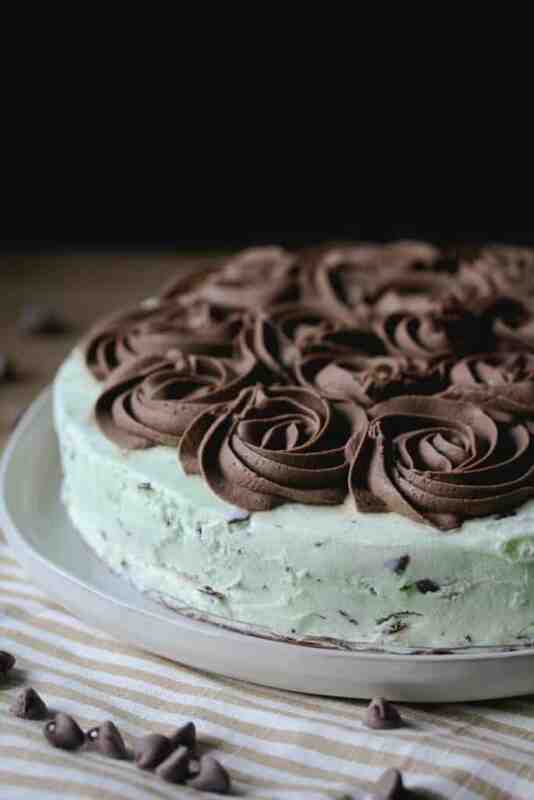 Mint chocolate chip ice cream over chocolate cake was always his favorite. Well, being the super awesome wife that I am, I made him one! The rest is history. Now every year I make him an ice cream cake and every year they are delicious! 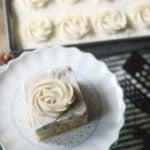 The best part about these cakes is that you can take it super easy on yourself and make it all right in a 9×13 pan. Which is precisely what I did for my dad’s cake when he also caught the ice cream cake fever! For that cake he requested butter pecan ice cream over yellow cake… which was also very delicious! The process of making an ice cream cake isn’t all that difficult. It’s just a tad time consuming. You have to let each layer freeze and you have to be patient about it. It’s a delicate balance of not rushing… and also rushing! Letting layers freeze solid, yet working quickly before it all melts! Below are the three basic steps. I love using Pamela’s cake mixes. They’re so good and gluten-free! (Pamela’s doesn’t pay me to say that, I just really love their products! They have been a life-saver on my gluten-free journey.) The size of the mix is perfect for this application, but you can use your favorite cake mix. * Prepare the cake according to the package directions. 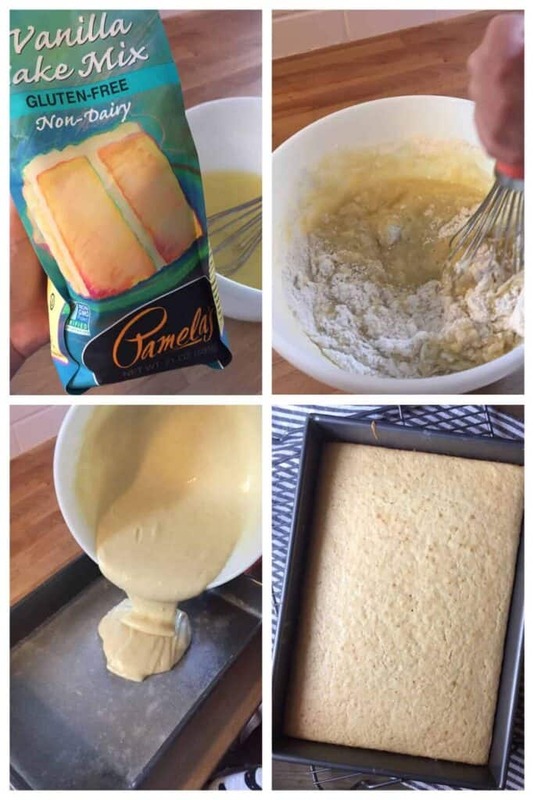 Bake and let cool completely. Freeze it if needed. *Pamela’s cake mix makes a 1-inch high 9×13 cake. If you have a mix that would make a thicker cake, you will want to divide it and possibly make some cupcakes with the extra batter. Let the ice cream sit out of the freezer to soften a bit and make it easier to spread. Spread it out evenly over the cake and then pop it all in the freezer. Let it harden for a couple hours. Don’t skimp here. You want it nice and frozen before we move on to step 3! For the sake good cake, please don’t skip this step… or use canned icing. I beg of you! It would be a travesty! (And no I’m not being dramatic.) 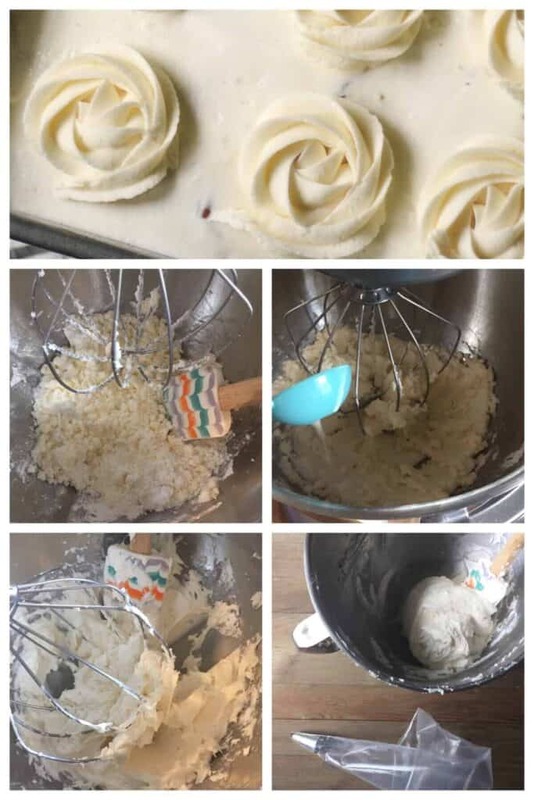 If you don’t know how or want to make buttercream… call me. 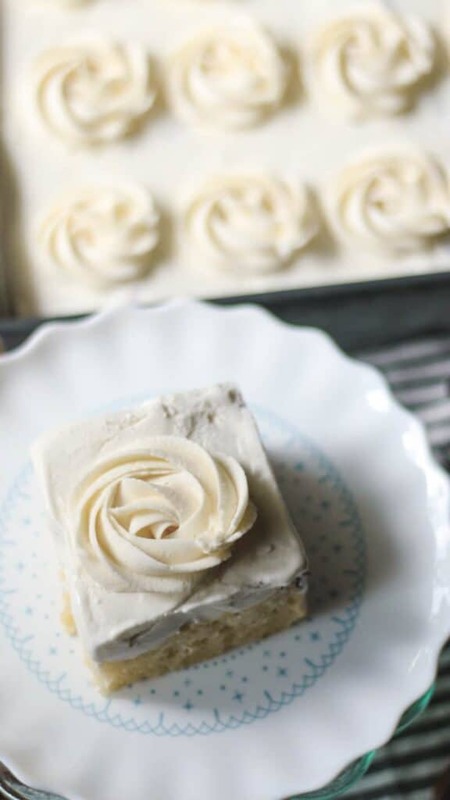 But if you want to make buttercream frosting, it is very simple! Here’s the basic rundown on how to make buttercream: blend softened butter with powdered sugar until crumbly. Add in vanilla and a little milk or cream. Keep blending until it lightens up and gets fluffy! If it’s too stiff to spread easily, add more milk… just a tad at a time! If it’s already too thin, add more powdered sugar. That’s it! Just keep blending and adjusting as needed until you get frosting that would be easy to spread and not too stiff. The key to frosting an ice cream cake is working quickly! First get your buttercream all set to go. To get the pretty rosettes, put a 1M tip in a piping bag and then fill it with your buttercream. Then after you’ve cleared a space to work, pull the cake out of the freezer. If it’s really hot in my house, I will work downstairs, right by (or even in, ha!) the deep freezer! Work quickly to pipe rosettes on top of your cake, here’s a quick video on how to do that. You don’t have to go crazy. Just pipe enough so that every piece will get some of that delicious frosting when you serve it! Once it’s frosted, quickly put it all back in the freezer until it’s time serve. Voila! You just made ICE CREAM CAKE! Since this cake lives in the freezer, you could really plan ahead if needed! You could feasibly keep it tightly wrapped for a month or more, before it went bad. (Not that it would last that long at my house!) 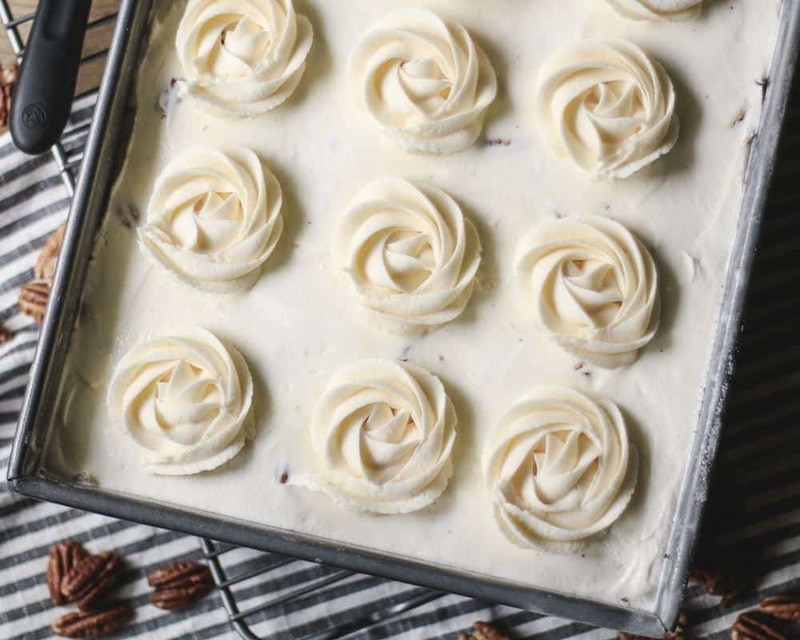 I honestly think this ice cream cake is even better than store-bought. You can customize it to be exactly what you want and use your favorite brands/flavors so it always turns out delicious! Bake the cake in an 8 or 9-inch pan. After baking and cooling on a wire rack, place the cake on a serving plate. Clean the cake pan and line it with plastic wrap to use it as a mold for the ice cream layer. Fill the mold with your ice cream and put it in the freezer to stiffen up. Meanwhile, if your cake is domed on top, use a long serrated knife to level the cake. When the ice cream has hardened, remove the ice cream from the mold and place on top of the cake. 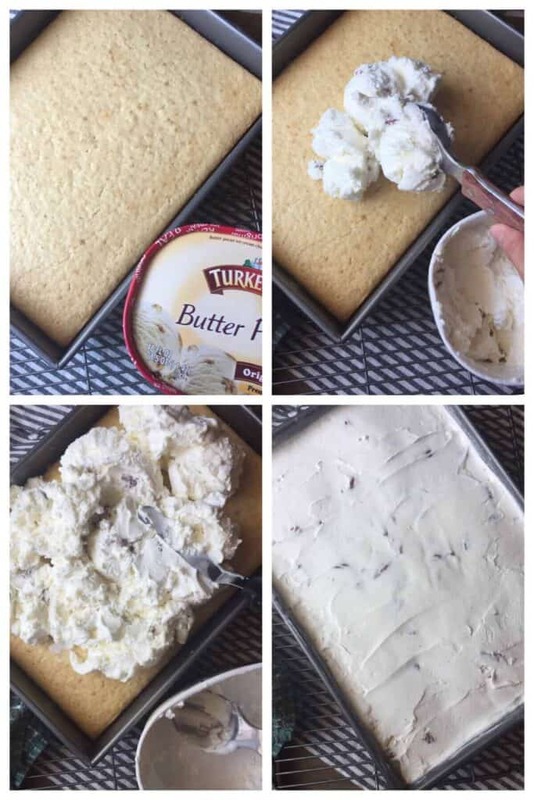 Use a spatula to ‘frost’ the sides of the cake with the ice cream. Place back into the freezer to freeze solid. Once solid, pipe rosettes with buttercream icing. As you can see, this method is a *tad* more difficult, but obviously yields a pretty presentation! The flavor combinations for ice cream cake are truly endless! What would your ideal ice cream cake combo be? Tell me down below in the comments! If it were my choice, I’d make Reese’s PB cup over Chocolate Cake… yum! Ice Cream Cake is a summer birthday tradition! Customize it with any combination of cake and ice cream flavors! 1 stick Butter softened to room temp. Cool completely. Put in the cake in the freezer to chill it faster if desired. Place the pan back in the freezer for at least two hours to harden. Place the softened butter in a bowl equipped with either a stand mixer or hand mixer. Mix in the powdered sugar (and optional cocoa powder) until combined and crumbly. Add in the milk 1 T at a time. Keep blending until fluffy, adding more milk to obtain an easily spreadable consistency. Place a 1M tip in a piping bag. Fill the bag with the frosting. Clear an area to work. 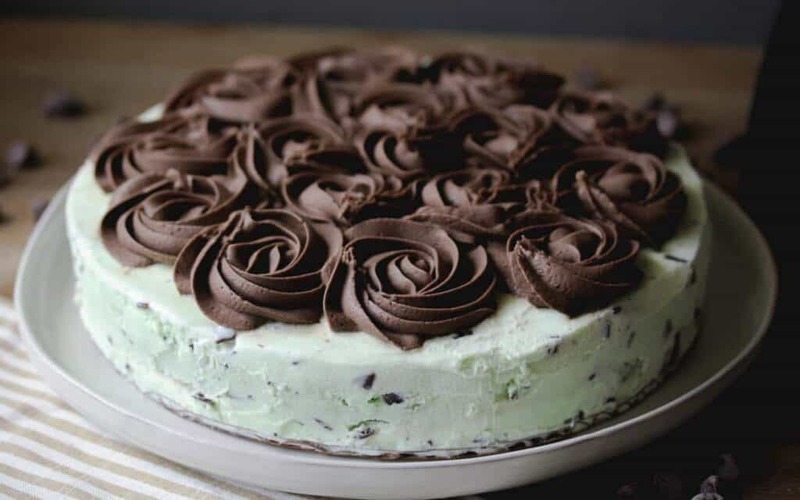 Pull the cake out of the freezer and quickly pipe rosettes all over the cake. I did 15 rosettes, 5 across x 3 down. You can do more if you like! Work quickly! Place the cake right back in the freezer and freeze for at least two more hours. Leave the cake in the freezer until time to serve. Pamela's cake mix makes a 1-inch high 9x13 cake. If you have a mix that would make a thicker cake, you will want to divide it and possibly make some cupcakes with the extra batter. Double the amount of ice cream if you want a really thick ice cream layer. The ice-cream layer was a little less than 1-inch thick when using only 1.5 quarts of ice cream. You also don't have to use a 9x13 pan. The process is basically the same for any shape of pan. For a round cake, turn the cake out onto a serving plate. Clean the cake pan and line it with plastic wrap to use it as a mold for the ice cream layer. Fill the mold with the ice cream and put it in the freezer to stiffen up. Level the cake layer if needed and then place the ice cream layer on top of the cake. Then 'frost' the sides with the ice cream and freeze. Once solid, frost with the buttercream. This method is a *tad* more difficult, but obviously yields a pretty presentation! Planning a party? Try making Crispy Pork Carnitas… I’ve made them for several family gatherings and they’re always a hit! And if you’re going to do that, you’ll need some salsa to go with it!